There's a popular refrain among National Park Service employees, one that doubles as a reminder, of sorts, after a long, wearisome day: "We get paid in sunrises and sunsets." For many park employees, the pay is seasonal and not great. The hours are long. The question is usually the same ("Where's the bathroom?"). And no matter how many pamphlets you pass out, instructions you give or "Attention!" signs you put up, people still wander off trails, carve their names in trees and get too close to the bears. 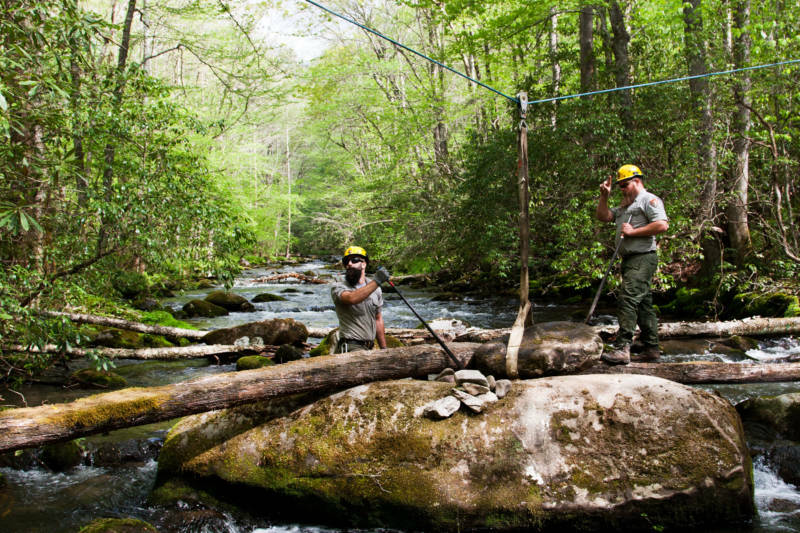 But what struck me the most were the reasons why — outside of the stunning sunrises and sunsets — people decide to work and dedicate their lives to a place like Great Smoky Mountains National Park. "It must have been the chicken salad," Bill Gober thought, hiking down from Laurel Falls on one of the Great Smoky Mountains National Park's most popular trails. His stomach was all knotted up. He was sweating bullets and short of breath. He made it down the trail to a creek, where he dipped his handkerchief in the water and sat on a rock. "That's when I called into dispatch and asked for a carry out," he says. Gober had started volunteering on the Laurel Falls Trail a couple of years after losing his job in the medical supply field. He was spending a lot of his time hiking in the park anyway. "It was therapeutic, an escape from reality," he says. So he figured he'd help out the park's staff by working as a trail rover one day a week, monitoring visitors and warning them about stuff like rattlesnakes and bears. "Mostly, I pick up a lot of garbage," he says. It was during one of those shifts, not long after a chicken salad lunch, that he had his heart attack. After calling for help, he was carried out by park employees and airlifted to Knoxville, Tenn., for bypass surgery. The doctors agreed that if it wasn't for the quick response and professionalism of park staff, Gober would have died on that rock. That's why he came back to volunteer on the trail as soon as he was physically able. You'll find him there on Wednesdays. "I definitely have some payback to give back to the park," Gober says. "I'm alive today because of it." Years before patrolling the Appalachian Trail as a law enforcement officer, Will Jaynes walked it under the trail name Hayduke, an homage to the law-defying radical environmentalist portrayed in Edward Abbey's The Monkey Wrench Gang. "I had long nasty hair and dirty clothes," says a short-haired, clean-clothed Jaynes. "I tell my boss now that if he wants someone to go undercover with thru-hikers I could look the part again pretty quick." 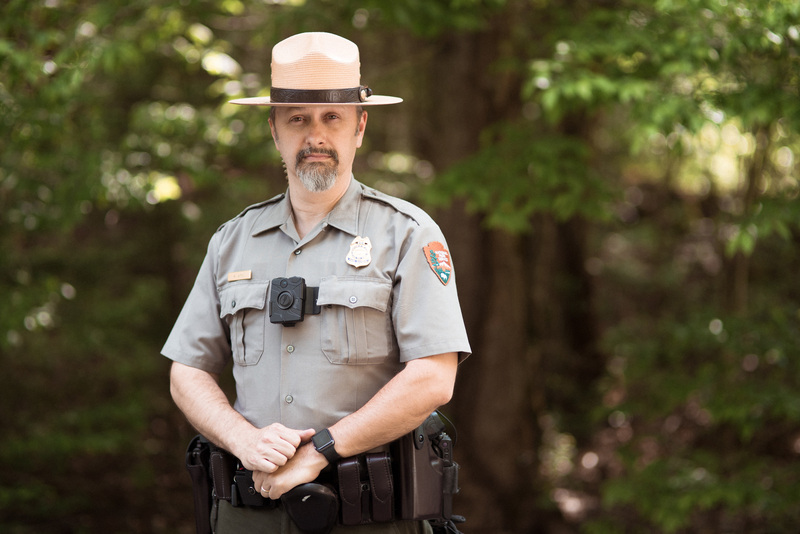 As a park ranger, Jaynes is part of a small police force tasked with policing the roughly 11 million visitors a year who visit the trail, which runs from Georgia to Maine. That includes thru-hikers and drive-thru motorists, RV campers and minimalists, outdoors people and city folk. It's no small task. And Jaynes says he draws on his experiences in previous jobs and in previous lifestyles to be a more relatable and effective police officer, a skill that he thinks has been made all the more important by recent events and public distrust with law enforcement. "If I can relate to someone and provide someone with education as opposed to a citation, that's what I want to do," Jaynes says. "The person that gets the ticket is going to angry and not as on board with the mission of the park service five years down the road, whereas the guy who gets the education is going to feel relieved and grateful and be way more likely to buy-in to what we're trying to do." "What are you doing in the Appalachian Mountains?" Michael Smith says he got that question a lot when he started working in Great Smoky Mountains National Park and living in the southern Appalachia. People didn't ask it in a derogatory or demeaning way, he says, but more out of a genuine interest. The Appalachian Mountains aren't known for their diversity. But that can be misleading. "If you dive into [the history] of an area like this, there were many different cultures that were in this area — Cherokee Indians, European settlers, even slavery was in this area," Smith says. "Those stories have to be told for people to know how they relate to these mountains." The National Park Service is facing larger relevancy issues nationwide. Most of its workforce and visitors are older and white, so engaging with younger and more diverse groups is key to its future. Relatability, Smith says, is crucial to that. 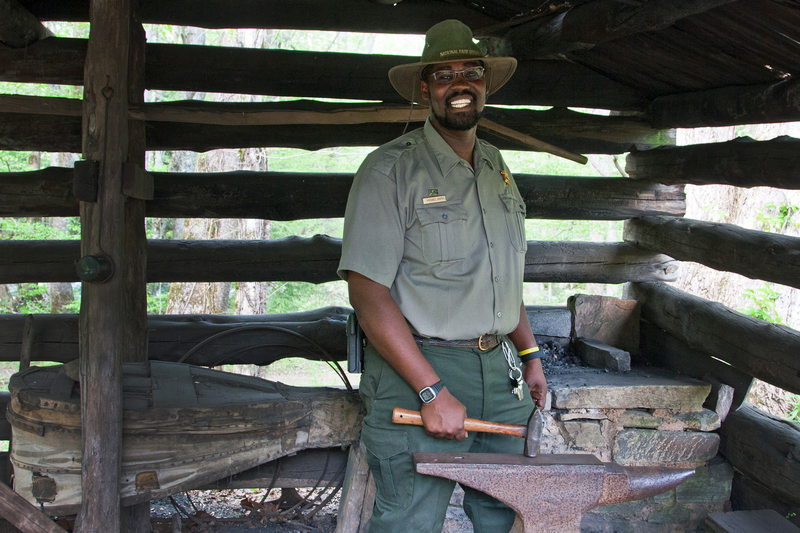 And as a Florida-born African-American who interacts with student groups from all across the South, Smith sees himself as being able to help fill that role in the Great Smokies. "People want something out of a visit. They don't want to come and visit just for the sake of visiting. They want a view or scenery or they want to be able to connect to the area and its history," Smith says. "To get those individuals you have to have something or someone for them to relate to." 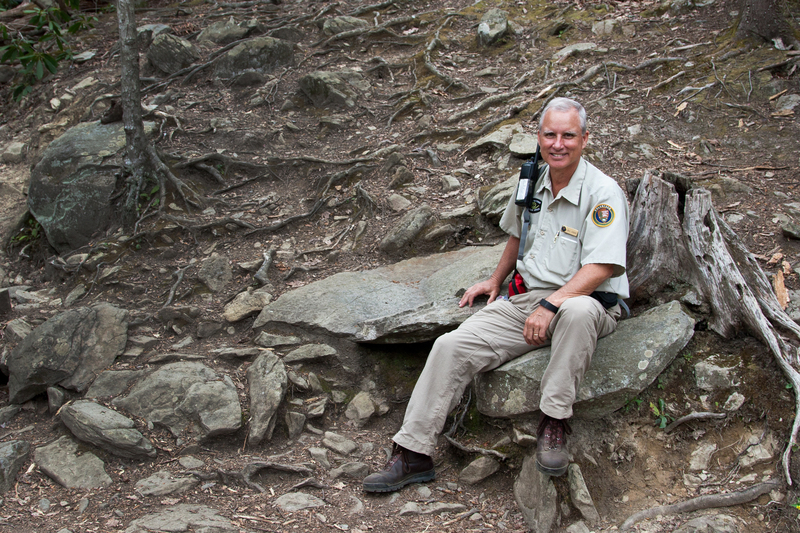 Paul Hadala started volunteering at Great Smoky Mountains National Park for a simple reason: "I was single at the time and needed something to do," he says. He'd spent 32 years with the U.S. Army Corps of Engineers as a military engineer, working on missile systems and dams; then another seven years teaching at Louisiana Tech University. 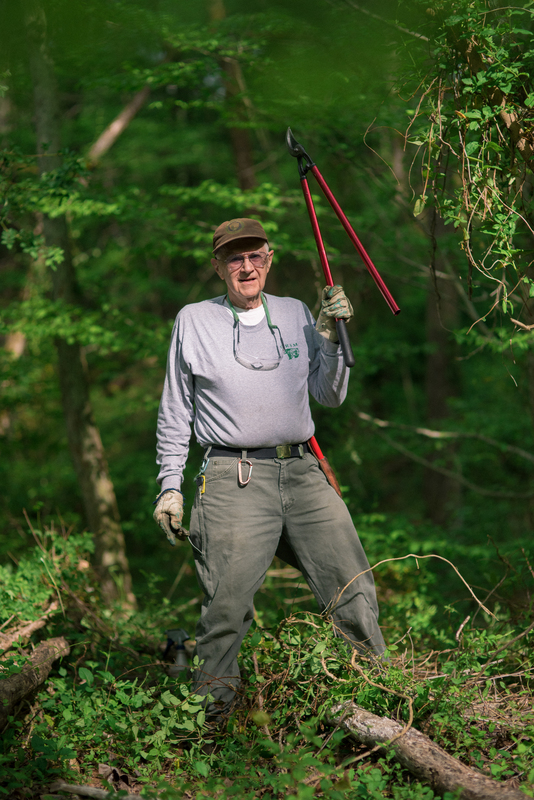 He was semi-retired and had time on his hands, so he decided to spend it killing invasive species. "I hate exercising. It's like pulling teeth," he says, chopping away at a vine of honeysuckle. "This is a good way to stay in shape." But Hadala's is a love story. Volunteering with the vegetation crew, he spends a lot of time with the crew's permanent and seasonal workers. After two summers of working with one of the seasonal employees, he mentioned to her that he was a bit lonesome and that "it would be nice to have someone to go to dinner with," he says. She introduced Hadala to her mom, and they've been happily married for 11 years since. Hadala still volunteers at the park 30 hours a week. Spending that much time at the park is good for their relationship, he says. "The wife said she'd marry me for better or for worse, but not for lunch." There are two corners of the porch of the main building at LeConte Lodge in Great Smoky Mountains National Park where, if the weather's just right, you might get enough cell phone service to make a call. Don't bother trying to load Facebook or stream a video. Sorry, millennials, it just won't happen at the highest-elevation guest lodge in the eastern U.S.
"That might be my favorite part of living here," says Jessica Tezak, a millennial herself. "I feel a lot less anxious." Before working at the lodge, Tezak was connected all of the time. She studied journalism in college and then did photojournalism internships. Neither allowed her to ignore her phone or the stress of always being on-call. "I couldn't escape it," she says. "And that's so not the person that I want to be." During an internship at the Knoxville News Sentinel, Tezak was assigned to take photos for a feature called Hike of the Month. Leading the hike that month was a couple, who had met at LeConte Lodge. "They had this beautiful love story," she says. When her internship ended, she thought back to the lodge and the way the couple described it as an "escape." She was feeling unsure about daily journalism and wanted a change, so she applied for a job. Months later, she's living at the lodge with a handful of other workers, cooking meals, washing dishes and helping out a rotating list of guests. It's not a dream job, she says. Someday she'd like to go back to full-time photography. But in the interim, she says, it's a good way to save money, meet nice people and enjoy the simpler things in life. Heidi Brill prefers to start her mornings early. 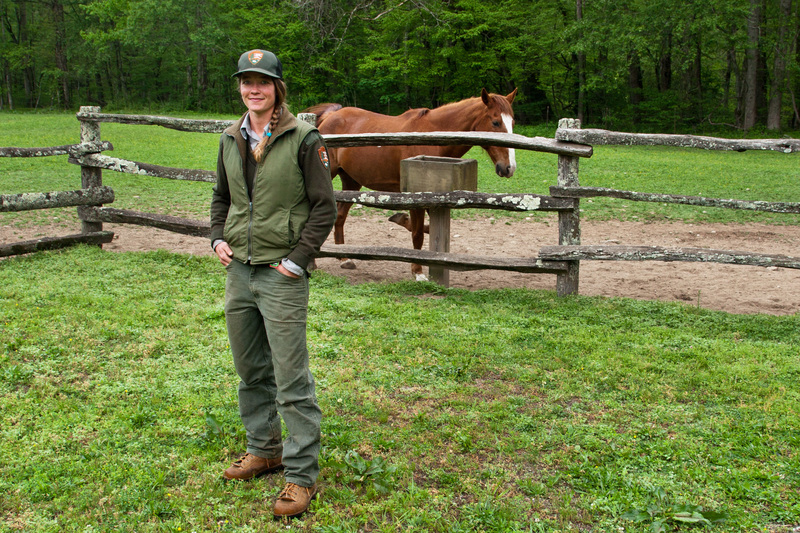 On days she's going to be on the trails, she's at the barn by 4:30 a.m. and out on the trail with the horses at daybreak. "Everything's so quiet," she says. "As the sun comes down and hits the forest floor, the animals start getting sweated up and steam's rising off of them." It's those moments that carry her through long days on horseback at the park, leading in teams of pack mules to haul equipment and supplies for maintenance workers in the park. It's backbreaking work, loading the mules up with crossbuck saddles and keeping gear evenly balanced. Brill's used to it though. She's been working on trail maintenance crews for the better part of a decade, mostly back West along the Pacific Crest Trail. In her early jobs, her crew would go out on long self-supported jobs, packing in eight days' worth of food, tools and personal gear. They'd cut new trails and clear old trails, sawing away fallen trees and sweeping away brush. There's an instant gratification that comes with that type of intense team labor, she says, a feeling of "Yay, we did this!" that comes from seeing a clean trail or new walkway.